The Esperanza Fire started October 26, 2006, in the San Jacinto Mountains above the Banning Pass near Cabazon, California. It destroyed 41,000 acres and dozens of homes and cost the taxpayers $16 million dollars. But by far the highest costs of the conflagration were the lives of the five-man crew of Engine 57, the first engine crew ever killed fighting a wildland blaze. Fire and superheated gases had erupted in a freak "area ignition," sending flames racing across three-quarters of a mile in mere seconds, engulfing the crew and the house they were defending. The deadly blaze was quickly determined to be no accident. Within a week, serial arsonist Raymond Lee Oyler was arrested and charged with almost two dozen counts of arson-and five counts of first degree murder. The Esperanza Fire recounts with drama and precision the gripping details of the fire and of Oyler's precedent-shattering trial and its stunning conclusion. 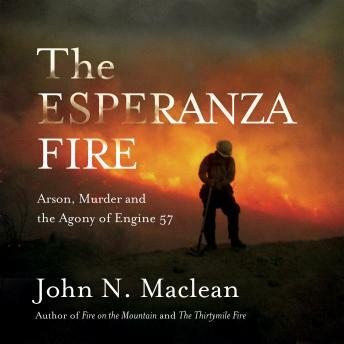 John Maclean spent more than five years researching the Esperanza Fire and covering the trial of Raymond Oyler. The result is a thrilling, moment-to-moment insider's chronicle of that devastating and tragic inferno and the pursuit, capture, and prosecution of the man who intentionally set it.